Noisy bugger Jesse Sanes helms the first release from Free The Land; a collaborative multimedia project focussed on the binds between nature and technology, which also involves contributions by Puce Mary, his partner in the JH1.FS3 duo, as well as Nial Morgan of the Presh label. 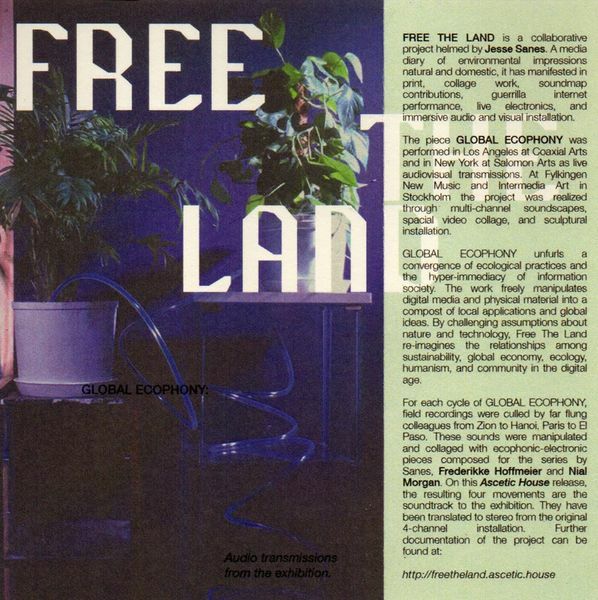 Previously manifest in print, as installations, and via “guerrilla internet performance”, Free The Land’s first physical musical release is the soundtrack to their immersive installation at Fylkingen New Music and Intermedia Art in Stockholm. Originally a 4-channel situation, it has been translated to stereo for this immersive release, conjuring a headspace that recalls the ambient environmental sensitivities of Rainforest Spiritual Enslavement as much as the variegated mutations of Portuguese project, Transflora. Weaving location recordings from the project’s colleagues in Israel, Vietnam, France and Mexico, along with original “ecophonic-electronic” pieces by Puce Mary and Nial Morgan, the results documented and described as Ecophony frame and bring to life a delicate yet rugged sonic ecology that’s arguably much greater than the sum of its parts. While ultimately everything comes thru Jesse for the final mix, the variety of voices and inputting hands becomes apparent as the session scrolls thru its persistently moprphing scenes of dense undergrowth, shoreside breezes, sunlit canopies and industrial farming sounds.